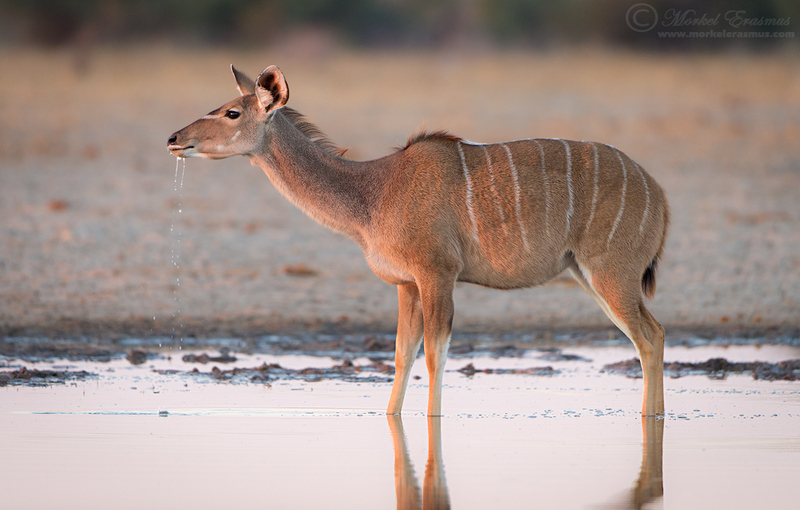 I've been making a point of sharing some photos of ungulates on my blog and Facebook page recently. 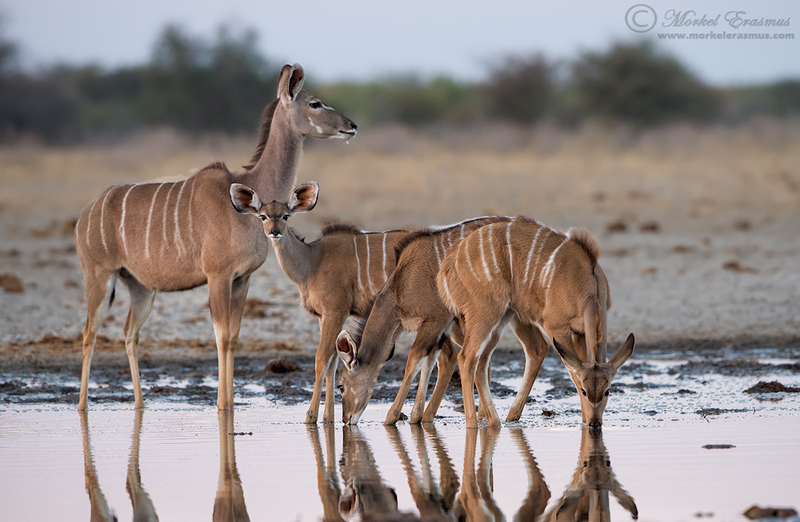 It's so easy to share the photos of the iconic big cats, other predators, elephants and rhinos...but many people have more appreciation for the lesser-known forms of life in the bush and actually enjoy seeing photos of them just as much. Giraffes are certainly an iconic African species, and frequently turn up on the lists of "have-to-see" animals for new safari tourists to the continent. They can be tricky to photograph, though, as their awkward lanky stature makes it hard to compose your photos in such a way to do them justice. This old bull was feeding on a tree by the roadside around sunset in the Kalahari desert one afternoon back in November 2012. 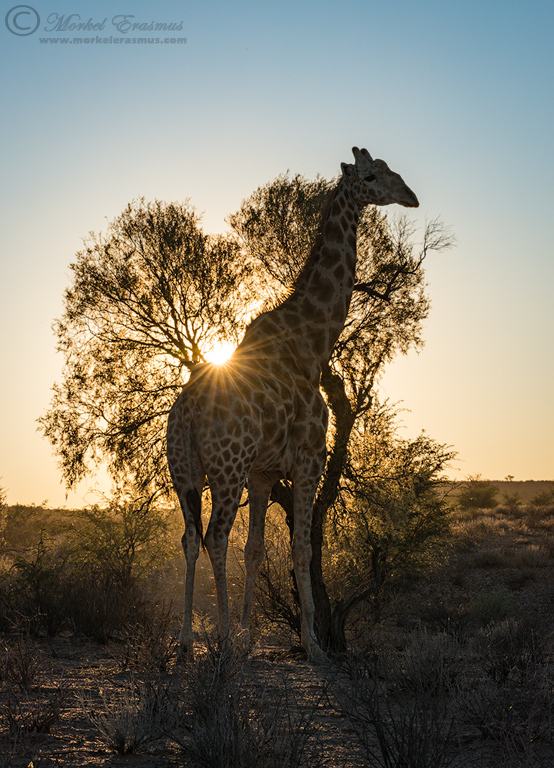 Giraffes were reintroduced to the Kgalagadi Transfrontier Park a couple of years ago after being hunted out many many years before that - and they are doing very well, particularly in the northern reaches of the Auob river valley where this photo was taken. I used the late afternoon mood and position of the sun here to add interest to the photo (after careful positioning of my vehicle). Stopping down my aperture to f22 helped me make the most of the sun's rays creeping over the back of the giraffe - creating the "sunburst" or "sunstar" effect. The incredible dynamic range of the Nikon D800's sensor allowed me to have immense detail to work with, even with shooting directly into the sun. I really am neglecting my landscape photography - which is a shame, because I really enjoy my landscape photography! Anyhow, I was in the mood to share an older landscape photo from my archives - so I hope you like this one. I captured this sunset a couple of years back on a local farm close to where I live. The farm belongs to family friends of ours so obtaining access is not a problem. 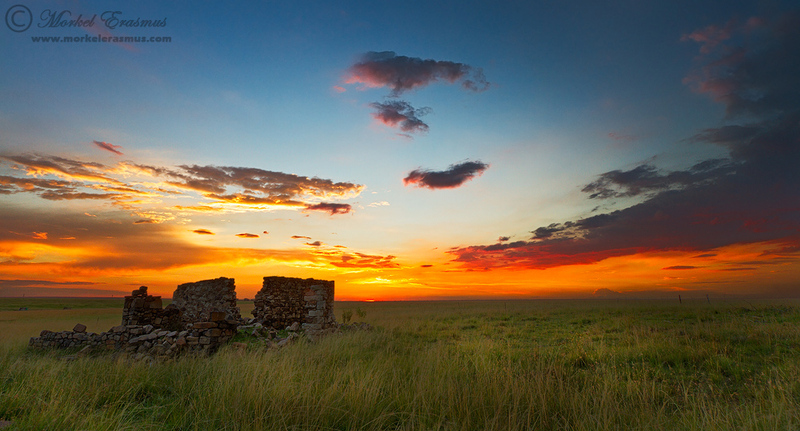 These old farmhouse ruins provide plenty of interest on the otherwise boring scenery of the Mpumalanga Highveld. I blended 3 separate exposures here to obtain the best representation of the dynamic range of the scene at the time. I thought it apt to post something that is NOT a "wider-showing-environment-animalscape" for a change, to show you that I do photograph tight, close portraits as well when I am in the field. 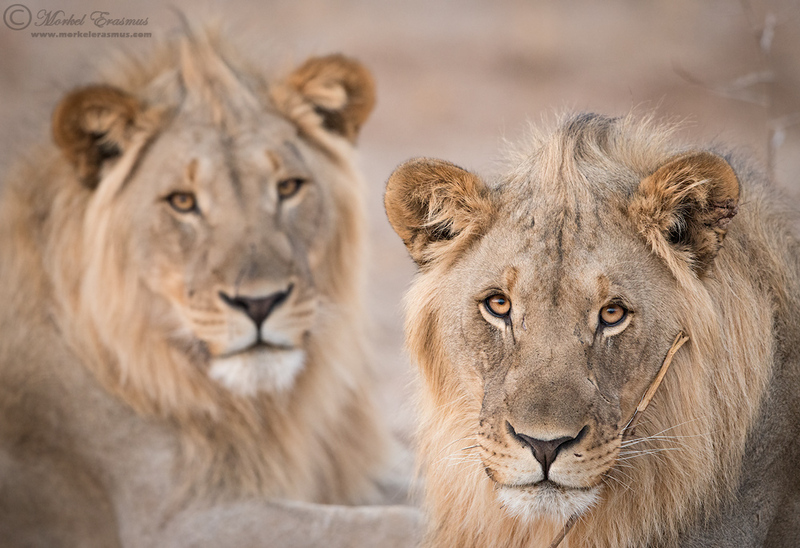 I was privileged to spend some quality time with these two brothers in Etosha last year during a week's intense photography and adventure with my friend Hans Rack. They were very cooperative models, and on my last afternoon in the reserve they posed very nicely in that soft glorious post-sunset light of Africa. The front-most lion was playing with a stick that you can see sticking up from the bottom of the frame. 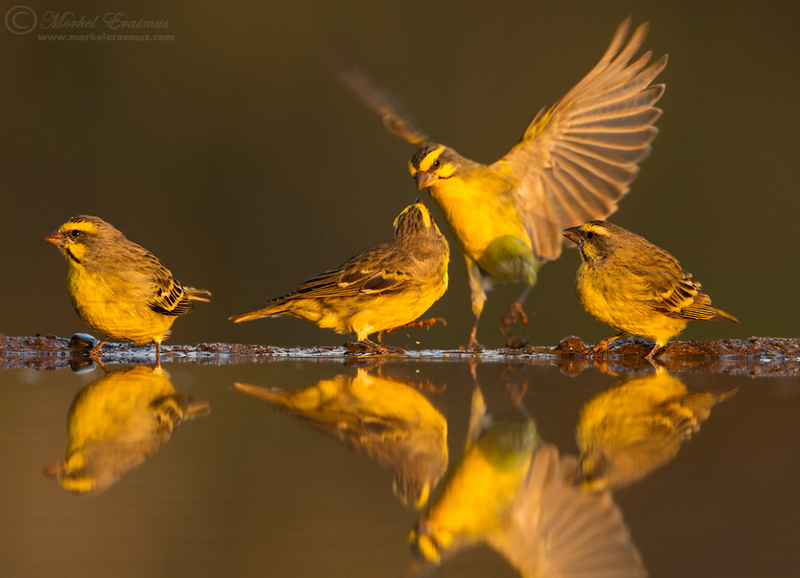 I love the repetitive poses here, and the earthy tones in the shot overall. Thank you very much for following my work. Feel free to share with like-minded people! Just a quick post this time around, folks. This is from my 2010 archives (I've got sooo many photos still unprocessed from then until now, so every now and again I dive into the depths of the archives). 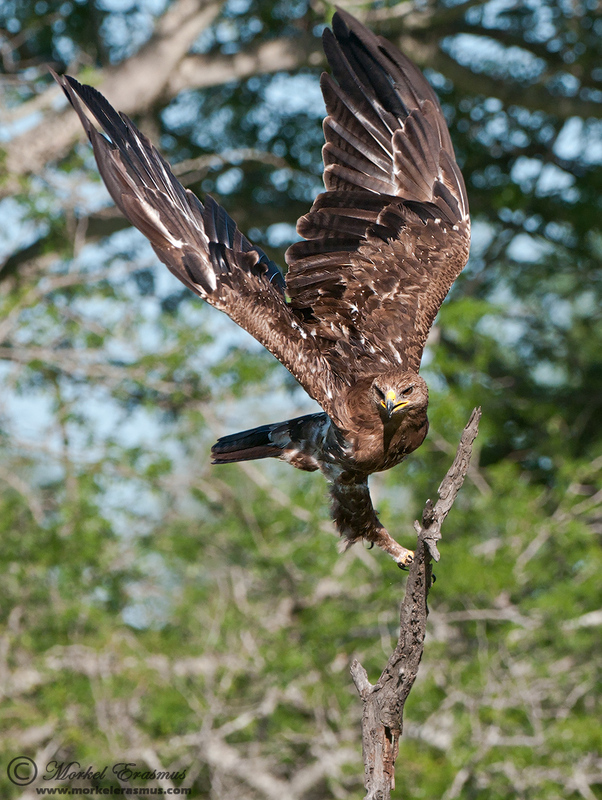 I captured this photo of the Lesser Spotted Eagle in the Kruger National Park one afternoon. I have some photos of it perched on the stump, but quite liked this "takeoff" moment with the wings stretched up and the feet just leaving the perch. As far as technically perfect bird photography goes, the background is a bit busy - but I don't mind that much as it's a rare bird to photograph properly (it's a summer migrant to South Africa). Wildlife photography, to me, is about telling the stories of nature and conveying a sense of the wonder of God's creation to my viewers. As a photographer, you need to be able to use all the tools at your disposal to do this. Besides the obvious - your camera and lens and the right settings for the shot you envision - you need to sometimes resort to cropping and post-processing techniques to "bring out" the story in the photo. 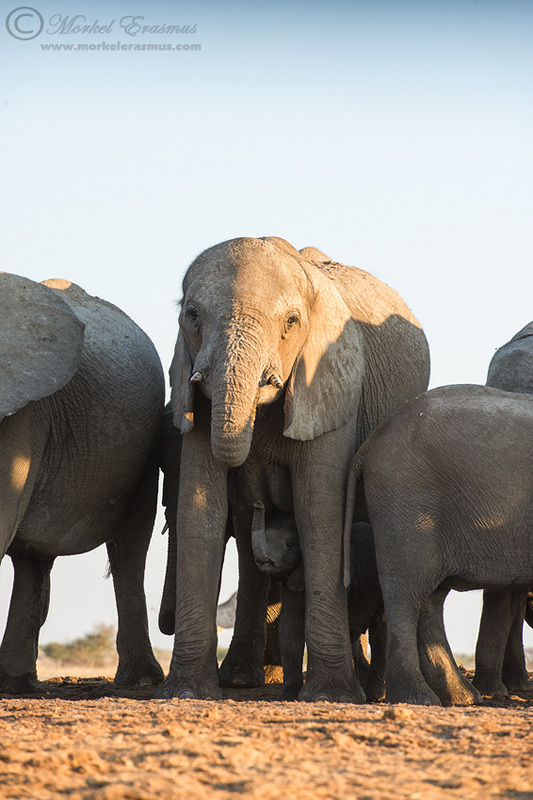 This photo of elephants drinking life-giving water was taken from an underground research bunker in Etosha National Park, Namibia. 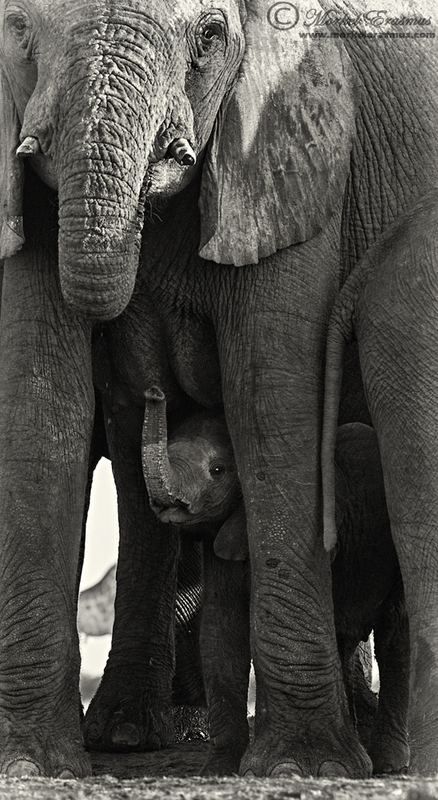 I was using a Nikkor 70-200mm f2.8 lens, but even after capturing the tender moment of the young calf drinking between his protective mother's legs, I felt that it needed an extra touch. I cropped to eliminate distracting elements - in this case the sky, the other elephants (as much as possible) and some of the foreground. Mom wasn't as important to me as the young one, so it wasn't necessary for me to have "all of her" in the frame. Not much I can do about the giraffe you see through her legs in the background, though. I also wanted to convert this to monochrome to avoid the brighter colours drawing your eye from the cute calf who was in the shade. Thanks for looking, and have a blessed week my friends.